Attention all the Physical Stream aspirants! Do you aim to be the PTI? 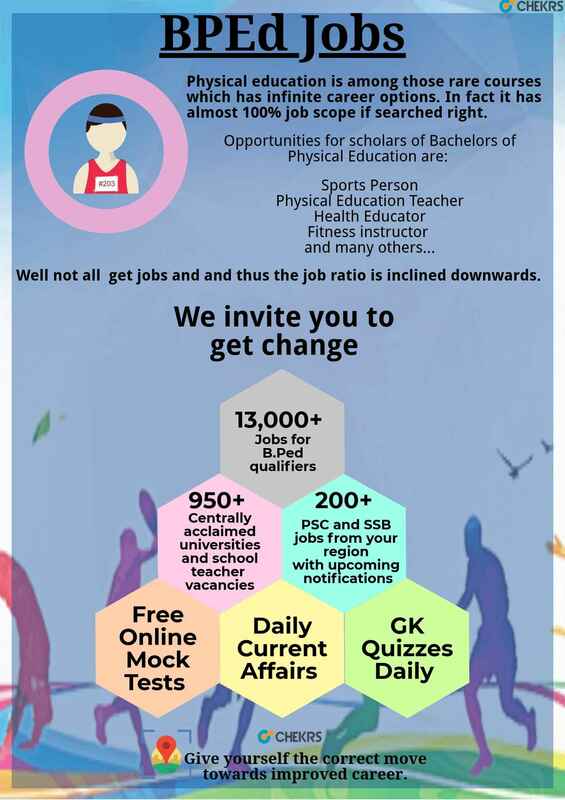 If yes whether you are a fresher or experienced you can rely on Chekrs to show you the best matches for Jobs for Physical Education Teacher. The B.P.Ed Government Jobs are one of the best career options for those who have graduated from the field. The graduation in Physical Education helps the candidates to participate in several athletic competitions while also to train others. Not just the PTI teacher, but you can also be the yoga teacher, games teacher and even the fitness in charge as per the interest and availability of options. Taking into account the government sector, the candidates can easily enjoy availing PTI Recruitment 2018 in different educational institutions like Schools, Colleges, Universities and even Sports Clubs. Moreover the candidates should know that BP Ed Jobs are highly paid having a promising growth. You can even be deputed for specialized training based on BPED Sarkari Naukari track record. However there will be constant change i.e. transfers in BPED Vacancy In Up, Bihar, Rajasthan, Haryana, etc place as per the norms of government. Contrary to government, the private sector of the BPED Vacancies ranges for a lot of options. There is requirement of the Tecaher/Instructor in each and every institution shaping the child. Well from the ocean of options, if you want to meet the selective PTI Vacancy 2018, then Chekrs is just the right place. We filter the Jobs for BPED coming from reputed and reliable institutions so that you can easily find BPED Vacancy that you have been looking for. You can even get the latest releases of the jobs by taking Chekrs subscription. Why Chekrs for B.P.Ed Vacancy? We strive to be the complete solution providing portal for every job seeker. Thus, you can here get all the most important study material and extra resources that can help you to excel in the competition of BPED Recruitment. You can avail the free previous papers, online quizzes and the mock tests that can brush up your skills to make sure you get selected.